Whispers in the Loggia: Ghan' in the Wind? Against the backdrop of Pope's first African trip in March, the release of B16's social encyclical and a Synod for the continent coming this fall, the Vatican PR shop might've taken to presenting 2009 as a "Year of Africa" for the church... from its start, though, the message had one glaring problem: for the first time since the early 1970s, the Roman Curia has lacked an African in one of its top posts. Now, however, word from Rome says that could change soon, and in an especially notable way, with the most reliable of the "court scribes" reporting that the African church's most-buzzed about senior cleric is likely headed for the Home Office. 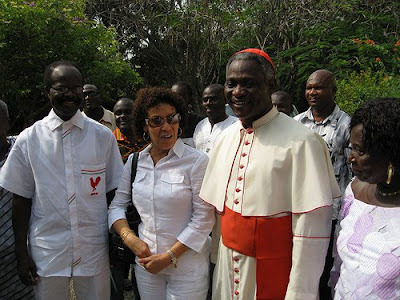 If Il Giornale's Andrea Tornielli keeps his batting average, Ghana's Cardinal Peter Turkson of Cape Coast will, in short order, succeed Cardinal Renato Martino on the latter's retirement as president of the Pontifical Council for Justice and Peace. Yet even if he doesn't, the report is just another indicator of the ever-growing attention that surrounds the 60 year-old who wears his country's first-ever red hat. The son of a Methodist mother and lone Scripture scholar among the 113 cardinal-electors, it's already known that Turkson has B16's eye: earlier this year, the Pope named the Ghanaian to the key task of Relator (spokesman) for October's Synod of Bishops for Africa, giving the cardinal his first major showcase before the global church's top rank. The move was particularly of note as, in the prior synods of his four-year reign, the pontiff's pointedly handed the high-profile post to two globally-known intellectual heavies among the College of Cardinals, both of whom enjoy Benedict's trust and, indeed, invariably appear on the shortlists for his successor: Cardinal Angelo Scola of Venice served as Relator of the 2005 Synod on the Eucharist, and Quebec's Cardinal Marc Ouellet manned the podium at last year's Synod on the Word. Celebrated for his intellect, humility and media savvy, Turkson already enjoys a global following among those who've crossed his path. Fluent in eight languages -- English, Italian, German and Hebrew included -- as a seminarian in upstate New York he painted a wall in his room black, using it as a chalkboard to study the latter. In his current post, the cardinal's kept a policy of making his transitional deacons live with him for their last year of formation to get a surer sense of their fitness for the priesthood. In a 2007 interview with the Times of London, Turkson spoke out against "notional Christianity" -- an encounter-less experience of faith where, he said, "definitions can be learnt by heart and just repeated to anybody who asks questions." "I think that our traditional way of making people Catholic needs to be reconsidered," the cardinal said. "The declaration that Jesus is Lord is meant to be an expression of a person's commitment.... [W]e need a radical conversion that will make the presence of God real and personal for each one of us." In his analysis, Turkson's linked the problem to an overemphasis on catechesis at the expense of evangelization; in Europe, in another 2007 interview -- this time with The Tablet -- the cardinal observed that European Christianity "started on an evangelistic base then developed a catechetics base. And it never found its way back to being evangelical. "The early years of the church were all based on evangelization," he added. "When the structures began to evolve and develop it became catechetical, notional -- you teach people certain things, they can repeat them, then you baptize them. "The emphasis on the thrust of evangelization -- provoking conversion in people -- and helping people find a real relationship with a personal God -- that gradually was missed out." Accompanied by a surge in priestly vocations, the African church has tripled in size over the last three decades to well past 150 million members, its proportion among global fold doubling to almost 15%. With Turkson guiding the discussions, the three-week October Synod will reflect on African Catholicism's role "In Service to Reconciliation, Justice and Peace." MoJo's Mid-Mich Message: "Obedience and Docility"
For Saginaw, a New "Waiter"